Mac OS X Server fast! Passenger takes comma, colon, or tab-delimited text, basic LDIF, Mac OS X Server & ASIP XML, or folder names of a user directory and imports names and other information to prepare for import into a server or other user file management functions. You can import first, last, middle, and/or full name fields and use the menus to devise a formulation for names/usernames, short names and repeating digit usernames using an arsenal of replacement tags from various imported data fields. Password generation is done by a tough algorithm that takes a combination of the master password and the username using a large internal word list or a list of words you supply. Passwords created this way can be regenerated with the same master password and username. Formulation is extremely configurable and with presets for styles such as word-word or word number combination for security and easy memorization. Duplicate checking is performed on Names/Usernames and short names against other imported users and against those already on the server and including multiple short names. Exports for Mac OS X Server and user-defined customized export. Using the either name or short names you may generate folders with those names including nesting user folders in group folders. You may even include to put folder names of your choice within these folders such as "Documents". Move documents and preferences from one set of account folders to another. Even if their names changed (such as to short names), it is possible to move files to their new home. 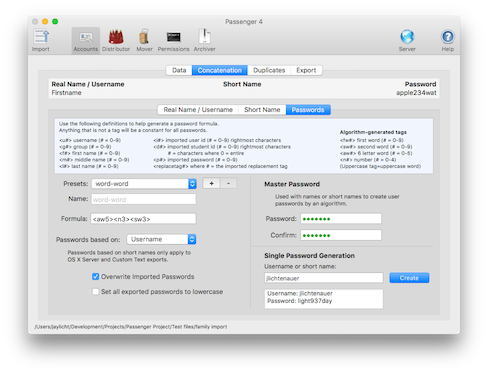 Set file-level permissions in batch for Mac OS X home directories as any user, locally or remotely. Even save those sets as shell scripts so you can add them to your system crontab. Use Distributor to distribute a file or folder to many home folders based on matching short name or to all. You can also use it to remove files. Save distribution sets as shell scripts for daily maintenance. Use Archiver to zip home directories you wish to remove. You can use this to select or exclude the home folders by finder label and username or short name.